​The exhibition Kenny Scharf opens at Nassau County Museum of Art on Saturday, March 19 and remains on view through July 10, 2016. The exhibition is sponsored by TAHARI Arthur S. Levine. 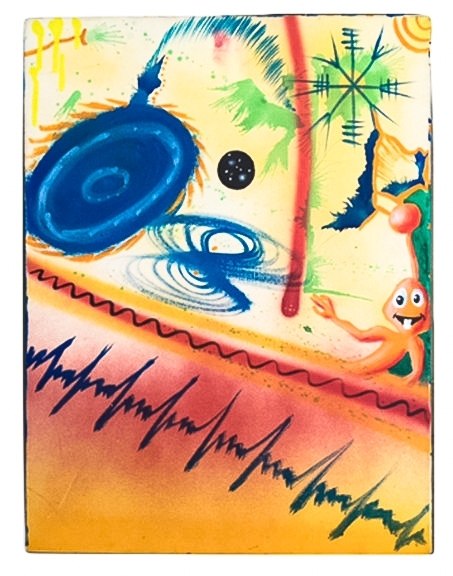 Emerging with the New York City graffiti and street art movement of the 1980s, Kenny Scharf (b. 1958) is known for his vibrantly colorful large-scale paintings and exuberantly playful installations. His imagery draws upon pop icons, media advertising and consumer culture of the 1960s, including TV cartoon characters such as the Flintstones and the Jetsons. 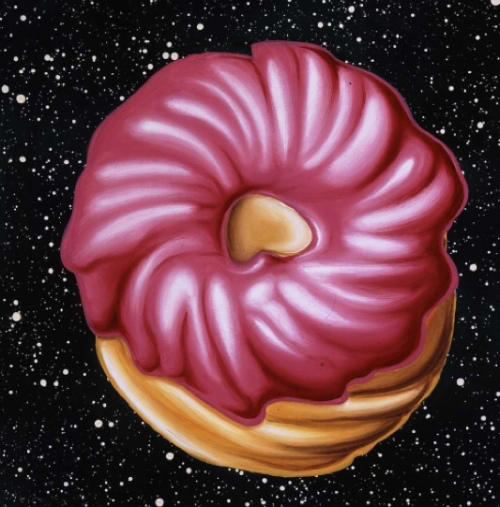 Curated by Director Dr. Karl E. Willers and the Museum’s staff, Kenny Scharf showcases major paintings and sculptures from throughout the artist’s career. Highlights of this exhibition are the expansive mural Pop Renaissance that surrounds the viewer, a version of the artist’s Cosmic Cavern club-like environment, as well as a recreation of the artist’s former Brooklyn studio complete with spattered walls, painted furniture and other workspace ephemera. 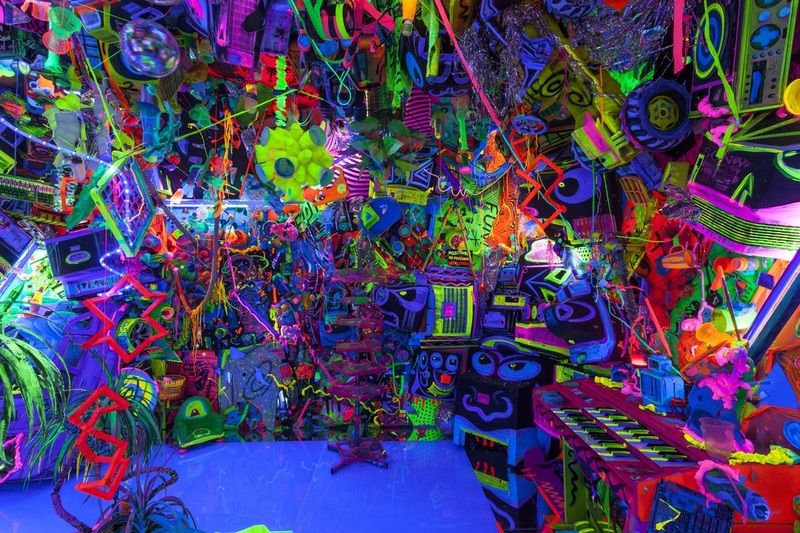 In speaking about his art, Kenny Scharf commented: “I believe the artist has a social responsibility to engage others in a thought process that ultimately brings the creative process into everyday life thereby enhancing the quality of our experience.” According to Art News, he inaugurated his iconic Cosmic Cavern installations when he turned his basement into one of the day-glo environments that have been his trademark since the 1980s. 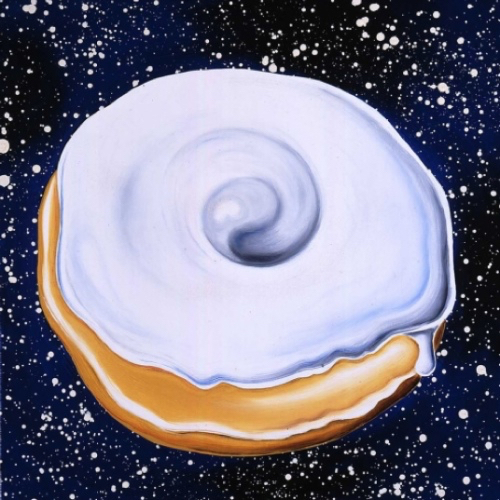 Versions of these Cosmic Cavern installations have been seen at the 1985 Whitney Biennial and at MoMA PS1 in Long Island City. Works by Scharf are also in the collections of such major New York institutions as the Whitney Museum of American Art, the Guggenheim Museum and the Jewish Museum. Internationally, works by Scharf have been collected by Mexico’s Museo de Arte Contemporaneo de Monterrey; the Ludwig Museum in Cologne, Germany; and the Stedelijk Museum of Amsterdam, The Netherlands. In conjunction with the showing of Kenny Scharf, the Museum is offering related public programming for adults and family groups. Museum docent Riva Ettus presents lunchtime talks on Kenny Scharf and his career on April 14, May 12 and June 9. Visitors are invited on June 19 to watch Kenny Scharf paint a new outdoor mural for the future Manes Family Art & Education Center on the Museum’s grounds. While the Kenny Scharf exhibition is on view, the artist’s vibrant and imaginative works serve as inspiration for other family and children’s programs, including weekly Neiman Marcus Family Sundays at the Museum, as well as Nature + Kids = Art on April 17, Spring Break for Art on April 26-28, and Summer Picnic Party on June 26. A companion exhibition, Glamorous Graffiti, looks at the work of Kenny Scharf’s contemporaries in the exciting New York graffiti and street art movement of the 1980s. Including a 1988 portfolio of five silk-screened prints by Keith Haring, a range of graffiti styles are explored through the work of the artists Jean Michel Basquiat, Lee Quiñones, Crash, Futura 2000, Toxic and many others. Films documenting early 1980s graffiti and urban culture are included in the exhibition. The artists A-One, Daze, Dondi, Koor, Lady Pink, Noc, Richard Hambleton and Rammellzee appear in the films Downtown 81 by Edo Bertoglio, Wild Style by Charlie Ahearn and Style Wars by Henry Chalfant and Tony Silver.